Excessive dead skin cell build-up can lead to poor functioning of the skin, which can lead to wrinkles, fine lines, premature aging, and breakouts. Our paramedical grade facial products can treat and help prevent many skin conditions and concerns. We can customize a series of facials to meet all your needs. Facial Information Form HERE, fill it out at home and bring to the spa on the day of your service. Our house specialty is designed to make you look and feel great. Specific products will be used to gently cleanse and exfoliate the skin, followed by a mask and moisturizers to help rebalance the skin. This treatment includes a hand, foot and decollete massage. Designed specifically with our male clients in mind to help his skin recuperate from climatic changes, daily shaving and stress. Whisk away dull skin and even skin tone with microdermabrasion. Lessen lines and wrinkles along with reducing acne scarring and hyperpigmentation. This anti age seaweed and mineral mask will exfoliate, hydrate and have immediate firming benefits. 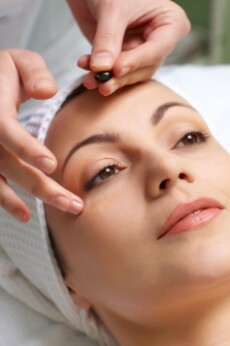 This facial is used to lessen the looks of fine lines and wrinkles. Dead skin cells are removed. This facial purifies and controls breakouts while helping to prevent new ones with extended extractions. It also reduces oil and maintains skins moisture balance. skin cells, and replenish skins moisture. pores, redness, and improves the skin tone and texture . massage as your mask removes impurities. Decreases Dark Circles, Puffiness and Wrinkles. leaving eyes and lips refreshed and renewed.